Create easy-to-understand contracts between piercer and client. 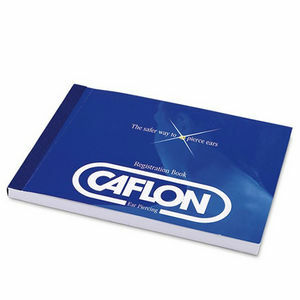 Caflon's Registration Book is another essential bit of kit for the piercer's tool box. The book acts as an authorisation and ear piercing application/release form, so that both parties easily understand what their responsibilities are. Any procedure like piercing requires a responsible, pragmatic approach—this book removes any concerns the piercer may have by virtue of making everything crystal clear. Contains 100 forms per book. £3.95 (inc. VAT) Why no VAT? We're a trade wholesaler and quote our prices without VAT to help our VAT-registered customers understand the true cost of a purchase. Absolutely love this tool! Throw away the foils! You can even do highlights and lowlights at the same time with no bleeding!